Castiglioncello, once an ancient Etruscan settlement, stands on a promontory in the Livorno Hills. The so-called “pearl of the Tyrrhenian sea” is an internationally renowned tourist destination of unique charm. With its red cliffs, secluded bays and clear waters, Castiglioncello has inspired many a painter, writer and poet. 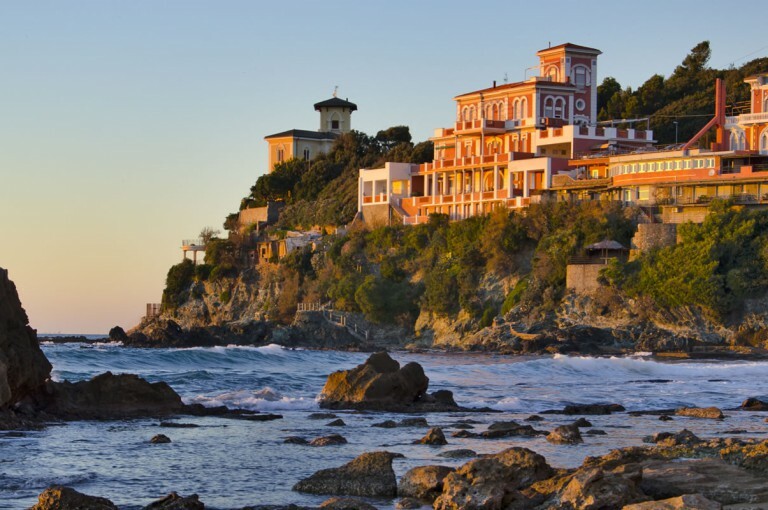 A Blue Flag holder, Castiglioncello is also a famous destination for fans of water sports, tennis and trekking. Diving enthusiasts from all over the world flock to the Chioma marina in Castiglioncello. The castle’s majestic archway leads into the old medieval town of Bolgheri. Inside the old town, a collection of picturesque alleys and tiny squares, you will find artisan workshops that sell regional products and local delicacies. Between 1838 and 1848, Bolgheri was home to poet Giosuè Carducci, who celebrated the town and its surroundings in his famous works. Standing on the top of a hill that dominates the surrounding sea and countryside, this charming medieval town developed around the Xth-XIth century Della Gherardesca Castle. Visit the village for the cobbled alleys, the natural terraces overlooking the sea or the countryside, the lovely squares, the old artisan workshops and the many local taverns (‘trattorie’). The town of Castagneto was renamed ‘Castagneto Carducci’ after the famous poet Giosuè Carducci, who spent there part of his life. The house where Carducci lived has been turned into a museum. Within the old city walls, proud memories of Volterra’s glorious past as a medieval commune still linger. Volterra’s medieval past is crucial to understanding the city’s present charm. The history of Vada dates back to the 18th century. The settlement stretches to the south of the Rosignano Solvay suburb. Vada has a fairly recent town centre, surrounded by a unique landscape of hills and sea. The area known in ancient times as “Bay of the Saracen” offerspine groves, wide strands, and shallow waters teeming with fish and ideal of scuba diving. Tourism is most active during the summer months, when plenty of attractions and activities are on offer. Located on a floodplain only 4m above sea level, and a few kilometres from the Tyrrhenian coast, the city of Pisa (pop. 92000 approximately) lies on both banks of the Arno river. Pisa is one of major cultural centres of Italy, with a unique artistic heritage that resulted from a medieval reworking of local tendencies with Islamic and Lombard influences. A must-see is the marvellous cathedral with its leaning tower. The monument was shortlisted for the Seven Wonders of the World.